With Easter coming up, this research about candy and restriction highlights the precarious dilemma parents face on a regular basis. (Hat tip to Natalia Stasenko at Tribeca Nutrition for bringing this study to my attention). Two naturalistic experiments are reported exploring the impact of parental restriction on children’s diets. For study 1, 53 parents gave 75 g of chocolate coins to their child over a weekend. For study 2, 86 parents were recruited prior to the 2 week Easter break when their children would be receiving chocolate Easter eggs. For both studies, parents were randomly allocated to either the non-restriction or restriction conditions and rated their child’s preoccupation with the target food and other sweet foods (demanding and eating) at the start and end of the interventions. Perceived and actual food intake was assessed. Children in the restriction conditions consumed fewer chocolate coins and Easter eggs. All children showed decreased preoccupation with chocolate coins or Easter eggs over the course of the studies yet by the end the restriction group were more preoccupied with the target food. In contrast, all children showed an increased preoccupation with other sweet foods as the studies progressed which was greater in the non-restriction group for the chocolate coins study. Overall, restriction resulted in reduced intake but relative increased preoccupation with the food being restricted. Non-restriction resulted in a greater preoccupation with other sweet foods once the target foods had been consumed. 1) Damned if you do: Restrict your child’s chocolate consumption and he’ll eat less of it but be more preoccupied by the chocolate than the child who wasn’t restricted. 2) Damned if you don’t: Don’t restrict your child’s chocolate consumption and he’ll eat more of it, be less preoccupied by the chocolate but more preoccupied by other sweet foods than the child who was restricted. Fortunately, these are not the only two options available to us. Just as restrictive dieting often leads to feelings of deprivation which can trigger overeating, we don’t want our children to feel deprived. However, this does not mean we have to give kids all the candy and junk food they want. 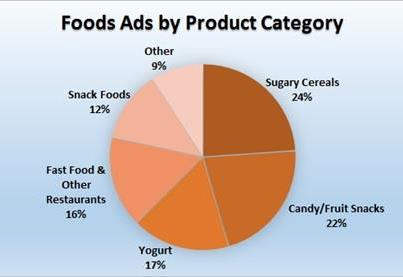 A better alternative is to reduce their exposure to food marketing. Marketing is designed to make children feel deprived of whatever’s being pitched so they will use their pester power to convince parents to buy the product. Reduce a child’s exposure and you will reduce the deprivation. Another way to help a child avoid feeling deprived is to give him something else he values even more. I offer my daughters gift certificates to their favorite bookstore or money to pursue their interest in horses if they choose to say “no thank you” to the food rewards and junk food they’re often offered. They would much rather have the long-term enjoyment of the alternative than the fleeting pleasure of the sweet treat. It seems no matter how small the ship or short the journey, sugar pretty much christens each and every voyage on which our children set sail. So this Easter, my daughters will likely have some dessert at the church potluck. It will probably contain more than their recommended daily limit for added sugar, but because we work hard to avoid exceeding that limit on a regular basis, it will truly be a rare treat. In many ways, it’s similar to children getting the recommended amount of sleep. Making an exception to stay up late for a child who regularly gets enough sleep is very different than for a child who is chronically sleep deprived. I will remind my daughters to savor their dessert and enjoy it mindfully. There is no need for me to overload the holiday with even more sugar by putting candy in their baskets or making dessert for our own dinner. Last but not least, what about the egg hunt? For the past few years, our church’s egg hunt is for empty eggs that the children trade in for small toys and books. Let’s hope it increases their preoccupation with reading instead of chocolate. Tags: Easter candy, marketing, sugar. Bookmark the permalink. Thank you for this summary of some of the studies in this area. We restrict intake and I would guess that she is indeed more preoccupied with sugary treats than other kids. She has very limited exposure to marketing, however: we don’t watch commercial TV and she rarely is in a conventional grocery store with me. Her exposure to candy and other “junk food” comes almost entirely from school. Her classmates often have candy bars or cookies or chocolate covered, sugar infused granola bars for their morning snack or in their lunch. Various classroom activities are rewarded with candy. She doesn’t get those things and she ends up feeling left out and coveting them.